Hosker Moore & Kent is designing upmarket shoe retailer Kurt Geiger’s first four standalone UK stores. It was appointed without a pitch. The four new stores will be divided into separate sections, reflecting the two Kurt Geiger brands: urban brand KG and the classic Kurt Geiger. The walls are lined in chocolate brown woven straw and the shoes will be displayed in white recessed, spotlit showcases. The interiors incorporate tulip chairs designed by Eero Saarinen in 1957, Florence Knoll tables and white leather sofas. The aim is to create an indulgent shopping experience with the feel of a fashion emporium, adds Kent. 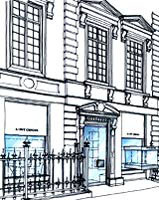 Kurt Geiger is introducing changing rooms to its South Molton Street store in London for the first time. The stores in London’s Sloane Street and South Molton Street, Leeds and Manchester open at the end of April.